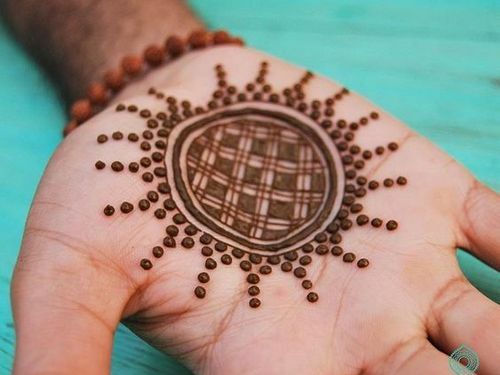 Mehndi is most popularly applied in countries like India, Pakistan or Arabic countries. Women adorn mehndi mostly on wedding occasions or any other traditional function. They feel incomplete or imperfect without it. 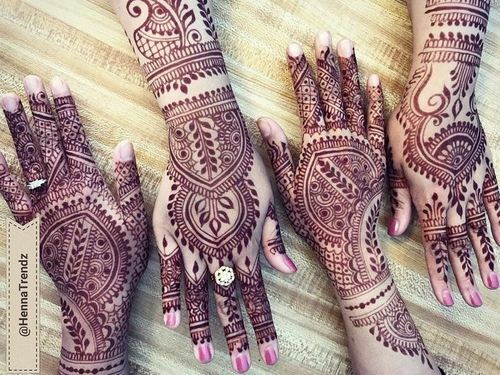 Everyone have their own ways of celebrating but mehndi is something that is a must ritual for every woman in all the celebrations no matter what. 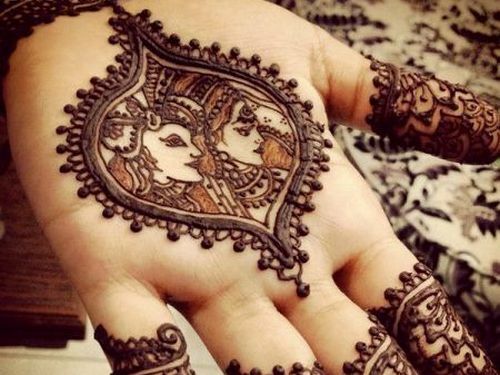 But today western countries too are fond of this beautiful mehndi art. Edgy mehndi tattoo designs are quite in fashion. 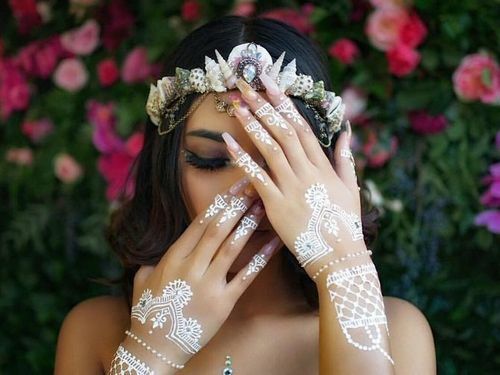 If you are one of those who just need a reason to apply mehndi, then these are the top 10 most fascinating Mehndi Tattoo Designs which you should definitely give a try. This beautiful design on the inner side of the hand is truly a work of art. Apart from the floral designs the intricate detailing gives this design an upper edge. 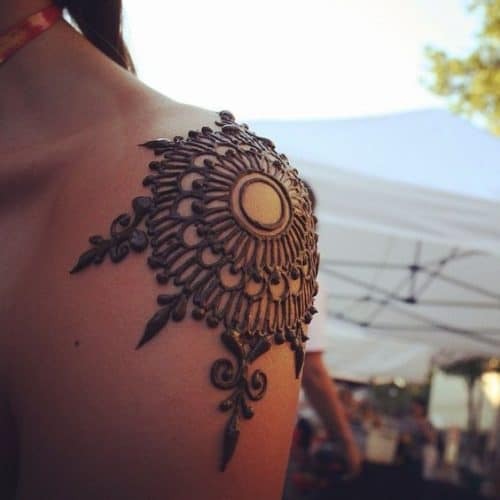 So if you are someone who loves detailing and mehndi, this is definitely your pick. This design stands out because of its unique shape and placement. The beautiful circular design on the shoulder gives a simpler yet elegant look. You can easily flaunt this design with off shoulder and halter dresses. If you are a mehndi lover and fond of tribal designs then why not give it a try. This design justifies the saying ‘true beauty lies in the details’ in the most perfect manner. A refined and very distinct design to bare your back in style. The chain like structure design gives it a more feminine look. 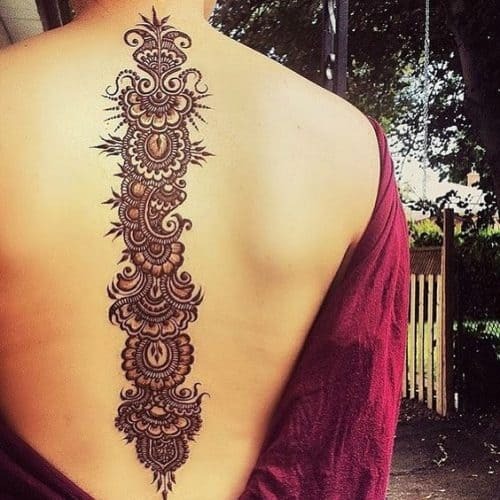 Another fascinating design for ladies who can dare to bare their back. 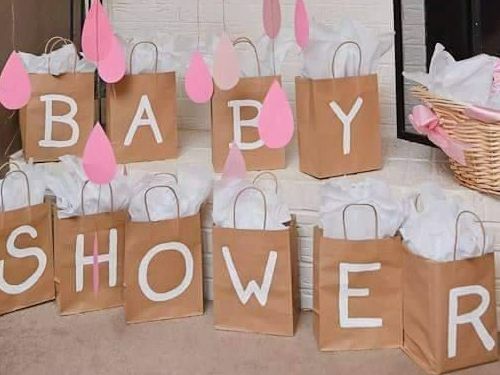 This is just the perfect design. It is neither too much and nor too less, just the perfect mix. The design flows so elegantly down the spine and is definitely going to accentuate your well toned back. 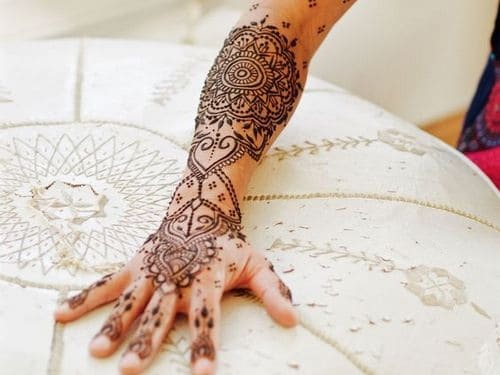 A design so pretty no mehndi lover can deny. With beautiful paisley and floral motifs it is a traditional yet chic option. 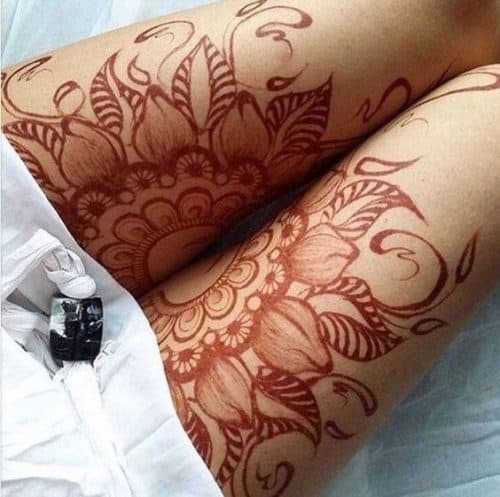 Thighs can be one of the best option for mehndi tattoo designs. Since, if one wants to flaunt her design then can go for short dresses and if not then can easily hide it too. This design is so stylish and chic. The perfect design to awaken the inner diva in you! And you wouldn’t have to worry about turning up in the office/college with mehndi. If you don’t want to compromise on your style quotient, go for this one. Another beautiful design that is suitable for all sorts of events, be it a wedding or a house warming or diwali or anything. Perfect for women who love to experiment! This detailed mehndi work tattoo design is sure to give your feet a royal feel. 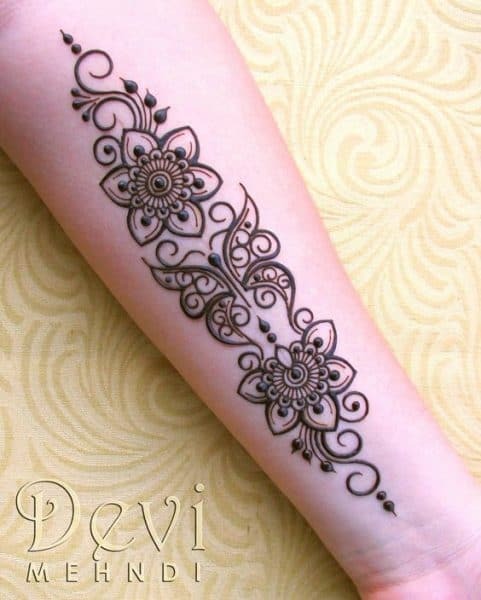 This one is just the perfect pick for women who love mehndi and want to have some fun and experiment with its design.. This design is just the perfect blend of style and creativity. This one is a beautiful design that is going to make you stand apart anywhere you go. The fine strips detailing of this design makes it stand apart. 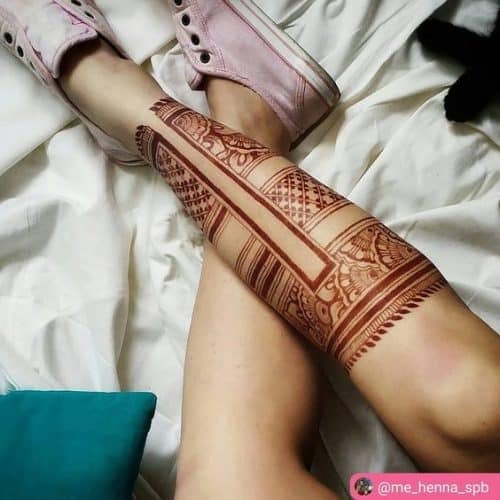 The unique pattern make your leg look even more attractive. Perfect for women who love a bit of unusual choice in their mehndi patterns! If you’re not a big mehndi lover but have to do it because of peer pressure then this is your design. Its simplicity makes it effortlessly beautiful. It contains beautiful circular pattern created using vine motifs. The two hearts are beautifully placed in the feet making it a cute mehndi tattoo design. What are you waiting for? Go and try these amazing designs and make those eyes roll. 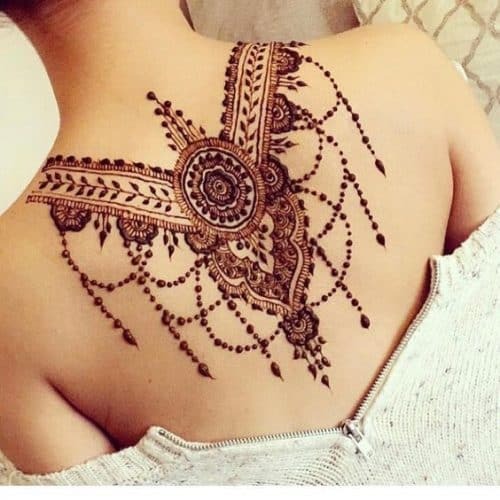 These mehndi tattoo designs don’t need any function they just need your mood to show some creativity and flaunt your style.